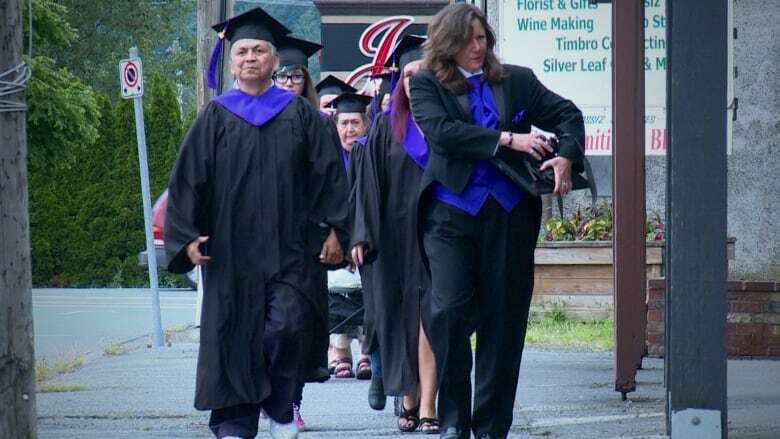 Two seniors in Agassiz are now receiving their high school diplomas, decades after life got in the way of their high school educations. 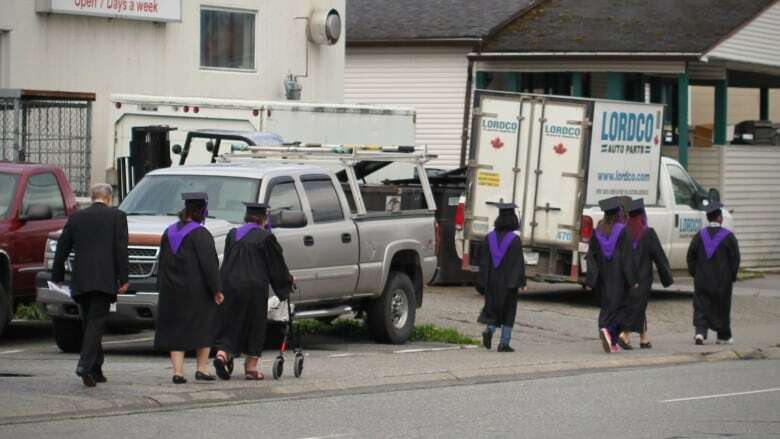 A small group of graduates in their ceremonial gowns walk down Cheam Avenue in Agassiz. Passing cars honk and the graduates, on their way to the Legion Hall, smile and wave. Two people in the group have waited decades for this day, though it wasn't clear it would ever come. Harvey Andrew, 62, and Virginia Knowlton, 74, both dropped out of high school when they were young. "Well since the early '70s, I've basically been struggling with life without the, ah — well with no real education, being a high school drop out," said Andrew. "I just managed to survive all these years. It's been challenging." 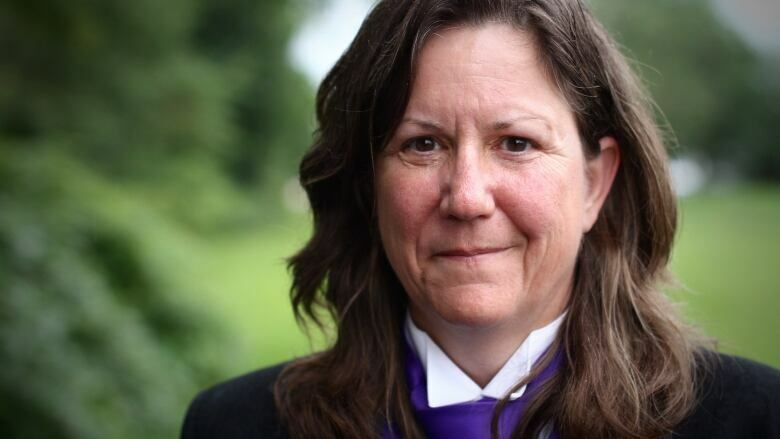 For Knowlton, education ended abruptly in Grade 9 when she had to take care of her younger sister and two brothers. "My mother had fallen and broken her hip and ended up in a cast, a full body cast for three months. So I had to get out and leave school to take care of my siblings and my father," she said. Knowlton didn't make it back to school after her mother healed up. She married when she was 18 years old. "I had three daughters and my husband was from the old school. He believed the woman's place was in the home, looking after him and the house. That's how they did it back then." Andrew also quit school to support his family, though he did so by getting into logging when he was in Grade 12. He spent his life doing all sorts of work, from security to baking to working as a night janitor before retiring and moving to Agassiz. It's there at the Legion Hall that he learned about a high school program for seniors at the Agassiz Centre for Education, or ACE. "The teacher walked into the Legion there and I just walked up to him there and told him I wanted to go back to school there and get my Dogwood high school diploma," said Andrew. "I started the very next day." "It was one of the most important decisions of my life," he said. The Legion was also where Knowlton learned about the program. "My friends said, 'Why don't you try and get your Grade 12?' I said, 'Oh no, I can't do that.' But I went for it, and it took me two years, but I did it." ACE Administrator Sandy Balascak has seen eight seniors graduate high school thanks to her program, including Knowlton and Andrew. 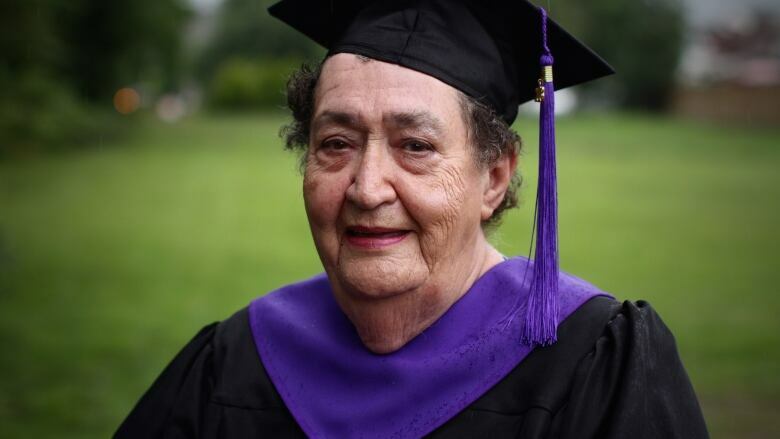 "To see them all graduating and get past those obstacles is inspirational beyond words," she said. Balascak has merged the alternative education program for youth with the adult and senior education program, so that all the students are in the same classroom. "It actually has a calming influence in the classroom and [the seniors are a] really good role model for these kids, because they're hearing the stories and recognizing how important school is." 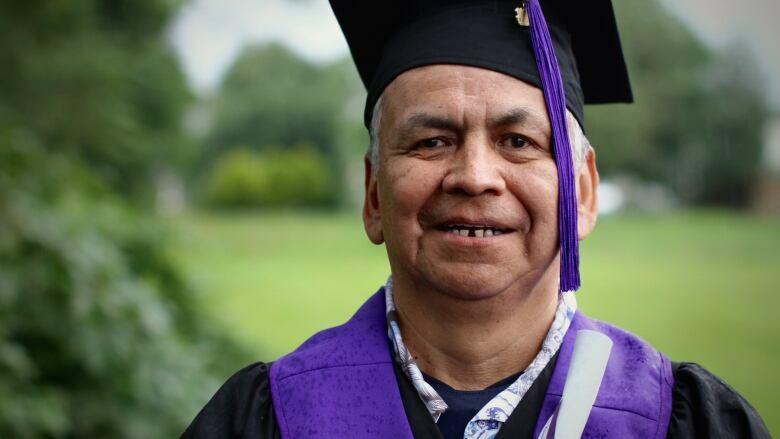 Some of the seniors weren't easily convinced to go back to school, but Balascak says none has ever dropped out of the program. "The seniors, once they commit, it's done," she said. "I feel real good. 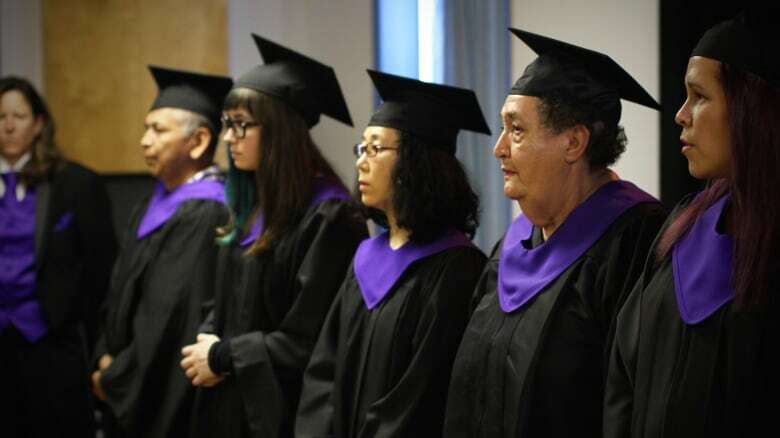 I feel light and bright," said Andrew on Thursday as he prepared for the graduation ceremony. "It will make it a whole lot easier. 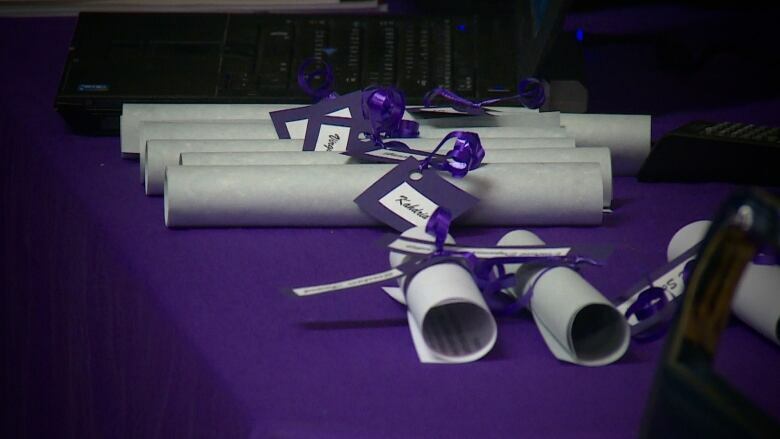 Now I have a tool there, a diploma to help me." 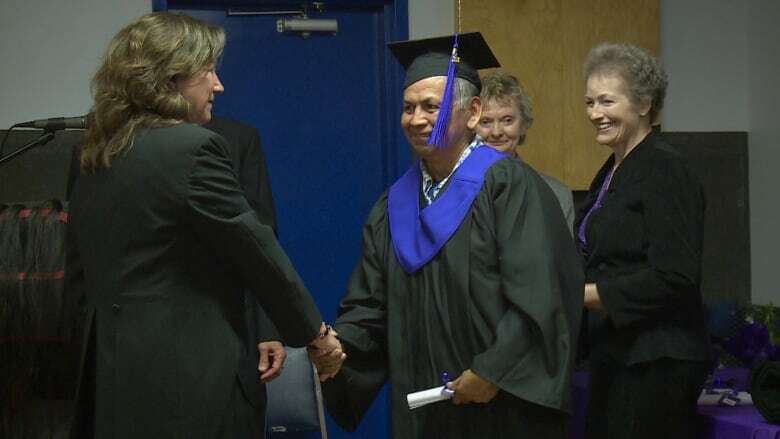 "There'll finally be a graduate in the family," said Andrew, noting that he's the first to get his high school diploma. For Knowlton, there's also a lot of pride. "I accomplished something I didn't think I could do, but I did it," she said. "I am very proud." Both encourage other people in similar positions to take the plunge and get back into school. "Just go for it. I would tell anybody, any senior, just go for. It's very, very good. It keeps your brain active and working," said Knowlton. Andrew, who plans to continue his education with a computer course, agreed. "Just do it. That's it!"